LET ME FIRST START BY SAYING, Thank You! 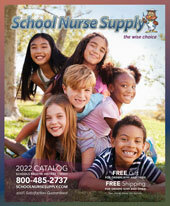 Your loyalty and continued business is what School Nurse Supply® is all about. As a company, we strive to build long-lasting relationships with our customers, supply top notch customer service, and provide you with the information and support you need to ensure you can do your job successfully. 2018 was a wonderful year at School Nurse Supply® and it is all thanks to you: our customers, friends, vendors and supporters. School Nurse Supply® is continually looking for ways to improve upon our already superior customer service. We strive to “Do it Better” by not only meeting your expectations but exceeding them as well. A happy customer is the best customer to have so if for any reason you find yourself in a position where we haven’t kept you happy please call 800-485-2737 and ask to speak to any manager within our organization to make sure we are holding up our end of the bargain. We encourage you to share your comments and suggestions too at customerservice@schoolnursesupply.com. Many of our new products and upcoming promotions have come by great input from our customers. And don’t forget, if you find the same item priced less elsewhere, we will gladly meet or even beat their advertised price. Did you know we have a secondary catalog KidStart Supply to complement our current product selection? This catalog focuses on the needs of early childhood, Head Starts and special needs children. If you’re interested in a copy of the catalog, please head on over to www.kidstartsupply.com to request a copy be sent to you. We take pride in the fact that School Nurse Supply® is a growing and ever-changing company. In addition to the catalog, our website is filled with internet specific promotions and specials that will be running throughout the year. Keep checking in to catch these great deals at www.schoolnursesupply.com. Our website boasts a friendly and fast user environment. You have the capability of viewing all our products in better detail, reviewing past orders and even chatting with our customer service specialists via live chat. Each year we look forward to going out on the road to local, state and regional conferences as well as visiting you in your schools. This one-on-one time is valuable to us because of the opportunity it allows our customers to see products hands on, and address any of your needs personally. If you’re having a conference or would like to meet your area sales representative, please send your request to us at conference@schoolnursesupply.com so we may accommodate you. Let me thank you again for allowing us the opportunity to be a part of another school year, and for trusting us to help you meet your individual goals for healthy students, faculty and families. Please contact us if there is anything we can “do better” for you.